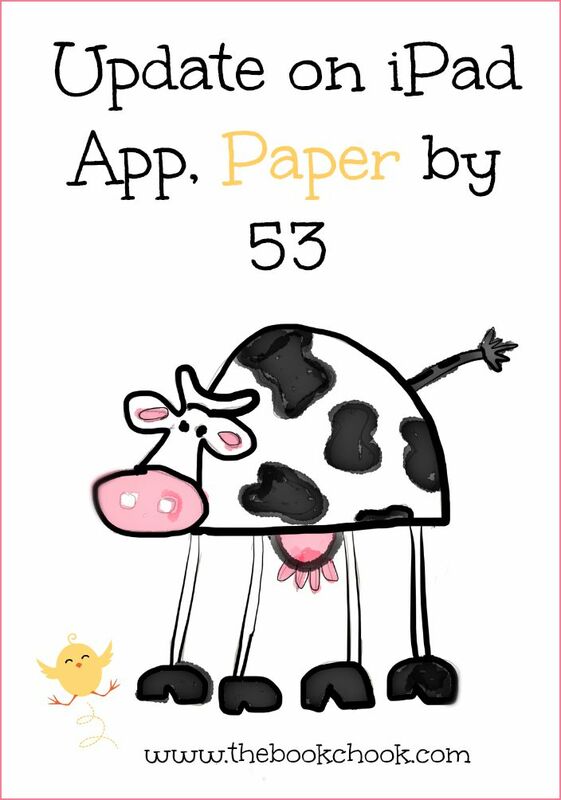 I thought you might be interested in discovering more about the iPad app I mentioned in Review of iPad App, Paper by 53 and Playing with Paper by 53, especially now all the in-app tools are free. Paper by 53 is also found in my list of Favourite Drawing Apps. Paper by 53 has excellent updates! Recently they gave us ThinkKit, with three new tools: Diagram, Fill and Cut. Diagram. A smart pen with style. Think Kit’s Diagram tool lets you draw objects, straight lines, connectors, and arrowheads. Cut. Rearrange and move shapes or words around on the screen. The Cut tool has a manual mode to draw freeform selection areas, or use Smart Cut to automatically select shapes without switching tools. Fill. Fill existing shapes with color, or draw new shapes with the color fills. Like the Cut tool, Fill has a manual and Smart mode, where you simply tap to fill a shape in with color. Presentation-Ready. Export your creations to PowerPoint or Keynote with our custom­-designed presentation templates that make your diagrams look great. Share Anywhere. Paper’s new sharing menu lets you open work in Paper in myriad other apps, including Trello, Slack, Dropbox, Box, and more. Export entire journals in PDF or PowerPoint format, or choose individual pages. Smart Shapes. Founded on years of scientific research, Intention Engine™ is our trademark drawing recognition and rendering system. It detects and corrects dozens of shapes sketched in real-­time – all while preserving the uniqueness and feel of hand-drawn lines. More recently still, the developers added several more new features, including the ability to draw on and annotate photos and that is heaps of fun for kids! I am also seriously impressed with the community encouraged in Paper’s Mix. Mix encourages users to share activities and tips. For instance, someone might set up a simple drawing challenge and make it available to others through Mix. Mix also has generous users who share tips with others. Here’s a page that shows an invitation to simply Mix a standard speech bubble. Each exercise like this just blows me away with the varied interpretations and overall creativity. Another thing that’s impressive is the way Paper helps users. I subscribed to their newsletter and I’m glad I did. Sometimes it might go over basics - partly for new users and also I suspect for chooks who probably missed something the first time. It also introduces the new tools that developers come up with. Paper offers excellent support documentation, as well as an opportunity to ask questions of users via the forum, or of course the traditional HELP email to the developers. I like the way their tutorials have not just text and images, but short animations/videos to help explain things. Check out the list of their videos on Vimeo. Even if you’re not using Paper as an app, for fun, for creativity or for productivity, why not check out Mix for ideas to use with your students? I love the idea of a fast creative session between more standard lessons, something for collaboration or for individuals. After kids have checked out various interpretations in a Mix activity, why not encourage them to create their own responses? You could ask kids to draw their own interpretation of an almost infinite number of common nouns, verbs and adjectives for example. Draw “bird”, draw “fear”, draw “melting”. Draw opposites like before/after. Represent a book or song title with a drawing. Draw a given animal without lifting your pencil. Draw a phrase or proverb for a friend to guess. Create a caricature of a famous person using only geometric shapes. Draw a self-portrait using only your least preferred hand. I hope you and your students enjoy Paper by 53 as much as I do. It's definitely one of my favourite apps, especially when I need some creating time, or a quick and moooving way to illustrate a blog post. In all honesty I can't say that my drawing has improved much, but the pleasure I get from it just keeps increasing! Check out Paper by 53 on iTunes. Check out my other iPad App Reviews and articles on Pinterest.